Although a papal citation of this sort rarely, if ever, states why a person is inducted into the “Golden Militia,” there can be no doubt that Donovan earned his knighthood by virtue of the services he rendered to the Catholic hierarchy in World War II, during which he served as chief of the Office of Strategic Services (OSS), the wartime predecessor to the Central Intelligence Agency (CIA). In 1941, the year before the OSS was officially constituted, Donovan forged a close alliance with Father Felix Morlion, founder of a European Catholic intelligence service known as Pro Deo. When the Germans overran western Europe, Donovan helped Morlion move his base of operations from Lisbon to New York. From then on, Pro Deo was financed by Donovan, who believed that such an expenditure would result in valuable insight into the secret affairs of the Vatican, then a neutral enclave in the midst of fascist Rome. When the Allies liberated Rome in 1944, Morlion re-established his spy network in the Vatican; from there he helped the OSS obtain confidential reports provided by apostolic delegates in the Far East, which included information about strategic bombing targets in Japan. Pope Pius’ decoration of Wild Bill Donovan marked the beginning of a long-standing, intimate relationship between the Vatican and U.S. intelligence that continues to the present day. 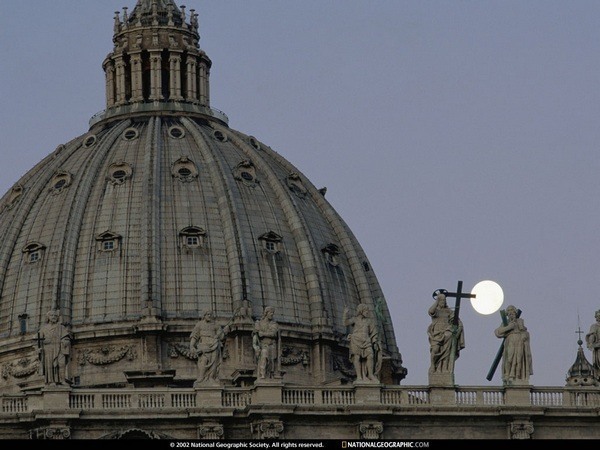 For centuries the Vatican has been a prime target of foreign espionage. One of the world’s greatest repositories of raw intelligence, it is a spy’s gold mine. Ecclesiastical, political and economic information filters in every day from thousands of priests, bishops and papal nuncios, who report regularly from every corner of the globe to the Office of the Papal Secretariat. So rich was this source of data that shortly after the war, the CIA created a special unit in its counterintelligence section to tap it and monitor developments within the Holy See. But the CIA’s interest in the Catholic church is not limited to intelligence gathering. The Vatican, with its immense wealth and political influence, has in recent years become a key force in global politics, particularly with Catholicism playing such a pivotal role in Eastern Europe and Latin America. Unbeknownst to most Catholics, the Vatican, which carefully maintains an apolitical image, not only has a foreign office and a diplomatic corps, but also has a foreign policy. And with Polish Communists embracing Catholicism and Latin American Catholics embracing communism, the U.S. government and particularly the CIA have recently taken a much greater interest in Vatican foreign policy. A year-long Mother Jones investigation has revealed a number of unlikely channels — both overt and covert — which the agency uses to bring its influence to bear upon that policy. collaborated with right-wing Catholic groups to counter the actions of progressive clerics in Latin America. It was in this last regard that the CIA supported factions within the Catholic church that were instrumental in promoting and electing the current pope, John Paul II, whose Polish nationalism and anti-Communist credentials, they thought, would make him a perfect vehicle for U.S. foreign policy. John Paul’s recent trip to Nicaragua could not have been matched by any American’s for the contribution it made to President Reagan’s Central American initiative. And hopes are high in Washington, D.C., that the pope’s forth-coming trip to Poland, where 90 percent of the people are Catholic, will respark the anti-Soviet uprising so vital to Reagan’s plans for Eastern Europe. Every year in late June a bizarre ritual takes place in Rome. Men and women fly in from all over the world to participate in a ceremony that has been performed for centuries. Next year, the assembled might find CIA director William Casey in their midst. And Casey could well be accompanied by former Secretary of State Alexander Haig. Casey and Haig are both members of the Knights of Malta, a legendary Vatican order dating back to the Crusades, when the “warrior monks” served as the military arm of the Catholic church. The knights, in their latter-day incarnation as the Sovereign Military Order of Malta (SMOM), are a historical anomaly. Although the order has no land mass other than a small headquarters in Rome, this unique papal entity holds the status of nation-state. It mints coins, prints stamps, has its own constitution and issues license plates and passports to an accredited diplomatic corps. The grand master of the order, Fra Angelo de Mojana di Cologna, holds a rank in the church equal to a cardinal and is recognized as a sovereign chief of state by 41 nations with which the SMOM exchanges ambassadors. But the real power of the order lies with the lay members, who are active on five continents. Nobility forms the backbone of the SMOM; more than 40 percent of its 10,000 constituents are related to Europe’s oldest and most powerful Catholic families. Wealth is a de facto prerequisite for a knightly candidate, and each must pass through a rigorous screening. Protestants, Jews, Muslims and divorced or separated Catholics are ineligible. “The eight-pointed white cross stands out everywhere as a symbol of charity toward mankind and as a comfort and consolation to the sick and the poor,” says Cyril Toumanoff, official historian of the SMOM. In recent years its members have carried on the Hospitaler tradition of the original knights by supporting international health care and relief efforts. They proudly offer aid to the needy regardless of race, creed or religious affiliation. In 1948, the SMOM gave one of its highest awards of honor, the Gran Croci al Merito con Placca, to General Reinhard Gehlen, Adolf Hitler’s chief anti-Soviet spy. (Only three other people received this award.) Gehlen, who was not a Catholic, was touted as a formidable ally in the holy crusade against godless Marxism. After the war he and his well-developed spy apparatus — staffed largely by ex-Nazis — joined the fledgling CIA. Eventually, hundreds more Nazis ended up on the U.S. government’s payroll. Among them was Klaus Barbie. The SMOM had given a different prestigious award in 1946 to another high-level CIA operative, James Jesus Angleton. “It had to do with counterintelligence,” Angleton told Mother Jones, when asked why he was chosen for such a distinction. During World War II, Angleton was head of the Rome station of the OSS. Later, on his return to Washington, he ran what was tantamount to the “Vatican desk” for the CIA. According to Angleton, the agency does not have a Vatican desk. Nor does it have an Israel desk, for that matter, yet Angleton also covered that area. The extreme sensitivity associated with Israel and the Vatican required that work relating to them be buried among Angleton’s counterintelligence staff, which was well-suited for such assignments. During the early years of the Cold War, Angleton organized an elaborate spy network that enabled the CIA to obtain intelligence reports sent to the Vatican by papal nuncios stationed behind the Iron Curtain and in other “denied” areas. This was, at the time, one of the few means available to the CIA of penetrating the Eastern Bloc. According to previously classified State Department memoranda, Angleton recommended that the CIA fund Catholic Action, an Italian lay organization headed by Luigi Gedda, a prominent right-wing ideologue who had also been honored by the knights. Gedda was a key operative in an effort undertaken by the CIA and the Vatican to “barricade the Reds” in the 1948 Italian elections. Only weeks before the election, it appeared the Italian Communist party would prevail. The CIA and the Vatican both feared the Communists might win unless drastic measures were taken. At the behest of Pope Pius XII, Gedda mobilized a huge propaganda machine. More than 18,000 “civic committees” were formed to get out the anti-Communist vote. The Christian Democrats scored a decisive victory. Catholic Action is credited with turning the tables. And who are the American Knights? Mother Jones managed to obtain part of the secret membership list. On it we found some familiar names: Lee lacocca of Chrysler; Spyros Skouras, the shipping magnate; Robert Abplanalp, the aerosol tycoon and Nixon confidant; Barren Hilton of the hotel chain; John Volpe, former U.S. ambassador to Italy; and William Simon, who served as both treasury secretary and energy czar in the 1970s. At least one former envoy to the Vatican, Robert Wagner (the ex-mayor of New York), and the current emissary to the Vatican, William Wilson, are also members of the Knights of Malta. But there is one institution that stands out as the center of the SMOM in the United States — W.R. Grace & Company. J. Peter Grace, the company chairman, is also president of the American section of SMOM. No less than eight knights, including the chancellor of the order, John D.J. Moore (who was ambassador to Ireland under Nixon and Ford), are directors of W.R. Grace. J. Peter Grace has a long history of involvement with CIA-linked enterprises, such as Radio Liberty and Radio Free Europe, which was the brainchild of General Rein-hard Gehlen. He is also the board chairman of the American Institute for Free Labor Development (AIFLD), which has collaborated with multinational corporations and their client dictatorships in Latin America to squelch independent trade unions. Up to $100 million a year of CIA funds were pumped into “trustworthy” labor organizations such as AIFLD, whose graduates, according to AIFLD executive director William Doherty, were active in covert operations that led to the military coup in Brazil in 1964. During the early 1970s, Francis D. Flanagan, the Grace representative in Washington, D. C., was a member of ITT’s “Ad Hoc Committee on Chile,” which was instrumental in planning the overthrow of Salvador Allende. AIFLD’s National Workers’ Con-federation subsequently served as the chief labor mouthpiece for the Pinochet junta. There are many other knights with CIA connections. Clare Boothe Luce, for example, the grande dame of American diplomacy, served as a U.S. ambassador to Italy in the 1950s and is now a member of the President’s Foreign Intelligence Advisory Board, which oversees covert operations. William Buckley, Jr., a former CIA operative and the editor of the National Review, is a member, as is his brother James, a former senator from New York and now undersecretary of state for security assistance. During the 1950s and the early 1960s, relations between the U.S. and the Vatican were conducted largely through Francis Cardinal Spellman, the “Grand Protector and Spiritual Advisor” to the SMOM’s American wing. An ultra-conservative ideologue, Spellman served as the right arm of Pope Pius XII and was a vocal supporter of U. S. military involvement in Vietnam. John XXIII felt that the Vatican had to adopt a more flexible posture — both socially and politically — if the church was to endure as a relevant institution. His attempts at rapprochement with the Soviet Union caught everybody by surprise and sent Vatican watchers at the CIA into a frenzy. But the agency had to step up its intelligence activity in the Vatican most cautiously, as the Kennedy ad-ministration was bending over backward to avoid any overt association with the Holy See. Kennedy, America’s only Catholic president, was so consumed by the possibility of a Protestant backlash that he rebuffed the pope’s efforts to mediate a thaw in East-West relations. Meanwhile Khrushchev, the supposed atheist, welcomed the pontiffs diplomatic overtures. Speaking with officials of the Curia, Spain discovered a great deal of discontent regarding the direction in which the church was moving. Some even suggested to him that the pope was “politically naive and unduly influenced by a handful of ‘liberal’ clerics.” He heard tales about “the moral and political unreliability of [the pope's] young collaborators.” Among those who were particularly concerned by Pope John’s policies, according to Spain’s report to McCone, were members of the Roman aristocracy and the papal nobility, who, according to Spain, had lost many of their traditional privileges when Pius XII died. John McCone now took a personal as well as professional interest in the Vatican situation. Thomas Kalamasinas, the station chief in Rome, was instructed to raise the priority of the Vatican spying operation. But the CIA ran into a snag when it learned that some of its best contacts — for example, the conservative prelates who held key posts in the Extraordinary Affairs Section of the Papal Secretariat, which was responsible for the implementation of Vatican foreign policy — were shut out by John XXIII’s tendency to circumvent his own bureaucracy when dealing with the Russians. The pope evidently feared that his diplomatic efforts might be sabotaged by some Machiavellian monsignor. Thus, he pursued his goal outside the normal channels of the Curia. A small group of trusted collaborators served as couriers for the pope, who rarely used the telephone to speak with anyone outside the Vatican for fear that the line might be tapped. When John XXIII died in 1963, CIA analysts prepared a detailed report predicting that Giovanni Cardinal Montini of Milan would be the next pope. They were right. But more amazing than the prediction is the fact that the agency was later able to confirm the identity of John’s successor in advance of the official announcement. How was the CIA privy to such information, given the excessive secrecy surrounding the College of Cardinals during a papal election? Italian intelligence sources maintained that the CIA bugged the conclave. Time magazine correspondent Roland Flamini speculates in his book Pope, Premier, President that the agency may have developed an informant among the cardinals, who communicated with the CIA through a hidden electronic transmitter. Giovanni Montini was no stranger to American intelligence. During World War II, he worked in the Office of the Papal Secretariat and passed information to a grateful OSS. Later he had a falling out with Pope Pius XII and was “exiled” to Milan. This news was well-received by Vatican watchers within the CIA, who had pegged Montini as a “liberal”. Nevertheless, he remained an important figure in the church, with extensive religious and political contacts. Every CIA station chief in Italy made a point of getting to know him, and CIA “project money” was donated to various orphanages and charities whose principal benefactor was the archbishop of Milan. When Montini became pope, taking the name Paul VI, he continued to pursue an open-door policy with the Soviet Union. Leaders from Eastern Europe were received on state visits (Soviet Foreign Minister Andrei Gromyko had seven meetings with Pope Paul), and many Vatican officials traveled to Moscow for talks. Toward the end of his papacy, Paul VI let it be known that he was not averse to a center-left coalition of the Italian Communist party and the Christian Democrats. This infuriated hard-line elements within the CIA. In 1976, the Georgetown University Center for Strategic and International Studies, a conservative think tank, sponsored a conference on the Communist threat in Italy. Panelists included former CIA director William Colby (who was station chief in Rome during the 1950s); Clare Boothe Luce, who was U.S. ambassador to Rome at the same time; Ray Cline, another ex-CIA official; and John Connally, then a member of the President’s Foreign Intelligence Advisory Board. Their message, which doubtless reached the pope, was unequivocal: Eurocommunism was a threat to U.S. security, and Marxists must never be allowed to participate in the Italian government. This was not the first time pressures from outside the Vatican were exerted on Pope Paul. In 1967, Paul authored a controversial encyclical, Populorum Progressio, in which he criticized colonial repression and recommended economic and social remedies that were widely interpreted as a denunciation of capitalism. Shortly thereafter, an international group of businessmen asked the Holy Father to “clarify” his economic views. The delegation included George C. Moore, then chairman of Citibank. Pope Paul subsequently issued a statement in which he denied any hostility toward private enterprise. Classified CIA studies prepared throughout the 1960s with titles such as “The Catholic Church Reassesses Its Role in Latin America” depicted a church with a commitment to economic and political reform. The studies foresaw the emergence of “liberation theology,” which would provide the theoretical basis for a “people’s church” that would establish itself in Latin America in the early 1970s. Pope Paul helped fulfill the CIA’s predictions by appointing socially conscious bishops and by encouraging church activists who opposed South American military dictatorships. Paul’s gesture toward the Left was, no doubt, a calculated maneuver directed at the hearts and minds of the Catholic masses. Political reality demanded the promotion of a palatable Christian alternative, lest the brethren put their faith in “Saint” Fidel or Che Guevara. At first, some CIA officials favored Paul’s reformist approach as an effective antidote to communism, but as time went by a consensus developed inside the agency that Paul VI had gone too far, that his strategy would backfire and play into the hands of the Marxist revolutionaries. As Pope Paul VI grew older, great concern developed within intelligence circles over who would succeed him. Agency analysts drew up profiles on leading papal candidates, identifying those who were likely to be sympathetic to American interests. In 1977, Terence Cardinal Cooke, the current Grand Protector and Spiritual Advisor of the SMOM, traveled to Eastern Europe to discuss the matter of choosing a candidate to succeed Pope Paul. During this sojourn, Cardinal Cooke met personally with Karol Cardinal Wojtyla of Krakow, who was noted for his anti-Communist leanings. Cooke’s coalition-building efforts bore fruit the following year, after Paul’s successor, Pope John Paul I, died, having served scarcely a month. (There were widespread rumors that he had been poisoned.) In October 1978, the Vatican’s Sacred College of Cardinals elected Karol Wojtyla as pontiff. “My Christian faith became very real to me,” remembers the priest, who survived two months of captivity and recovered in a psychiatric ward. Liberation theology came to life in the form of thousands of grassroots Christian communities that sprang up throughout Latin America, where nine out of ten people are Catholic, and eight out of ten are destitute. Within these groups, religion became less a ritualistic phenomenon and more an inspiration to clergy and laity attempting to remove the yoke of oppression from the poor. Some priests even began to align themselves with the left-wing guerrillas engaged in armed struggle against U.S.-backed regimes. “The Christian base communities are the greatest threat to military dictatorships throughout Latin America,” said Maryknoll Sister Ita Ford in late 1980, three weeks before she, two other American nuns and Jean Donovan, a lay missionary worker, were brutally murdered in El Salvador. The CIA was quick to recognize the “subversive” potential of liberation theology and mounted an extensive campaign to undermine the new movement. The agency’s strategy, formulated during the late 1960s and early ’70s, when Richard Helms was director, was to exploit the polarization between the activist clergy and those who still identified with the established order (the holdovers from the Cold War era, when missionaries were routinely employed as agents and informants). Toward this end, as Penny Lernoux documents in her book Cry of the People, the CIA used right-wing Catholic organizations in Latin America to harass outspoken prelates and political reformers. The agency also trained and financed police agencies responsible for the torture and murder of bishops, priests and nuns, some of them U.S. citizens. In 1975, the Bolivian Interior Ministry — a publicly acknowledged subsidiary of the CIA — drew up a master plan for persecuting progressive clergy. The scheme, dubbed the “Banzer Plan” — after Hugo Banzer, Bolivia’s right-wing dictator (who retained Klaus Barbie as his security advisor) — was adopted by ten Latin American governments. The plan involved compiling dossiers on church activists; censoring and shutting down progressive Catholic media outlets; planting Communist literature on church premises; and arresting or expelling undesirable foreign priests and nuns. The CIA also funded anti-Marxist religious groups that engaged in a wide range of covert operations, from bombing churches to overthrowing constitutionally elected governments. The success of the Banzer Plan was vividly demonstrated in San Salvador in the late 1970s, when an anonymous group distributed a leaflet that read: “Be a Patriot! Kill a Priest!” A series of clerical assassinations followed, culminating in the murder of the progressive and popular Archbishop Oscar Arnulfo Romero. More recently, the Reagan administration has sharpened its attack on progressive elements of the church, both at home and abroad. The Santa Fe Report, prepared for the Council for Inter-American Security and presented in 1980 to the Republican Platform Committee by a team of ultraconservative advisors, states that “U.S. foreign policy must begin to counter (not react against) liberation theology as it is utilized in Latin America by the ‘liberation theology’ clergy.” In order to garner support for this policy, the Institute for Religion and Democracy (IRD), an interdenominational organization, was established in 1981 with funding from right-wing institutions, including the Smith ‘Richardson and Sarah Scaife foundations, both of which have served as CIA financial conduits. The IRD unleashed a propaganda drive against church activists at the forefront of domestic opposition to U.S. aid to the government of El Salvador and other repressive regimes in Latin America. The IRD campaign has been highly successful, even reaching the pages of Reader’s Digest, from where it was picked up by 60 Minutes. Of all the groups that are engaged in the U.S.-sponsored campaign against liberation theology, none has played a more significant role than Opus Dei (“God’s Work”). A fast-growing Catholic lay society whose political activities are shrouded in secrecy, Opus Dei was founded in 1928 by Jose Maria Escriva de Balaguer, a young Spanish priest and lawyer. Escriva espoused complete obedience to church dogma. Today, there are more than 70,000 members of the order in 87 countries. Only a small percentage are priests. The rest are mostly middle- and upper-class businessmen, professionals, military personnel and government officials. Some are university students. The members contribute regularly to the group’s financial coffers and are encouraged to practice “holy shrewdness” and “holy coercion” in an effort to win converts. The tentacles of “Octopus Dei,” as it is sometimes called, stretch all the way to the U.S., where David Kennedy, former chairman of Continental Illinois Bank and treasury secretary under Richard Nixon, is said to be a “conspicuous friend” of the conservative religious order, despite the fact that he is a Mormon. Continental Illinois owns shares of an Opus Dei bank in Barcelona (for more on Kennedy’s links to the church, see box, page 37). This is particularly true in Latin America. In Chile, for example, Opus Dei elicited support from Chilean bishops for the overthrow of President Salvador Allende and worked closely with CIA-funded organizations such as the Fatherland and Liberty goon squads, which subsequently merged with DINA, the dreaded Chilean secret police. In 1971, the CIA began financing the Chilean Institute for General Studies (IGS), which has been described as an Opus Dei think tank. Its members include lawyers, free-market economists and executives from influential publications. One of the leading IGS staffers was Hernan Cubillos, founder of Que Pasa, an Opus Dei magazine, and publisher of El Mercurio, the largest newspaper in Santiago (and one that was subsidized by the CIA). After the coup, a number of IGS technocrats became cabinet members and advisors to the Pinochet junta; Cubillos served as foreign minister. Opus Dei powerbrokers have gained enormous influence inside the Vatican since they helped install the current pope. The courting of John Paul II began when he was still the archbishop of Krakow. He was asked to speak at Opus Dei colleges and at the group’s international headquarters in Rome. In an effort to enhance Wojtyla’s image as papabile, these speeches were printed by Opus Dei in book form and circulated among members of the Vatican hierarchy. When Karol Wojtyla became pope, he returned the favor by elevating Opus Dei to the unique status of a “personal prelature.” Critics of Opus Dei fear that the pope’s edict will allow its members to elude the authority of local bishops in special circumstances, thereby strengthening the order’s tendency to function as a “church within a church.” This was an important victory for Opus Dei, which had been rebuffed on previous occasions by both Pope John XXIII and Pope Paul VI. It is rather ironic that John Paul II should chastise priests for engaging in political activity when he is by far the most overtly political pope of modern times. A strong patriot, John Paul has even threatened to fight alongside his countrymen should the Soviets try to crush the workers’ rebellion in Poland. And his political activism has not only included well-publicized trips and rhetorical speeches. With his approval, the Vatican quietly funneled $40 million to Solidarity. But despite the pontiff’s support for the Polish union — and the issuing of an encyclical in strong defense of the rights of labor — his sympathies do not extend to the rights of workers in Vatican City: he has opposed demands for decent wages by the Vatican’s low-paid employees, and there have even been rumblings of a possible strike. John Paul II came to the Vatican during troubled times for Catholicism. Political upheavals in Poland and Latin America promised to make the new pope’s job more than that of spiritual leader. Karol Wojtyla knew that, as did the cardinals who elected him. And the CIA, which knew that another John XXIII could spell disaster for U.S. foreign policy, doubtless brought its influence to bear on the election through Opus Dei and the Knights of Malta. Thus far it seems likely that the agency is, on balance, fairly pleased with the pope’s performance. Yet the pope’s deeds often do not reflect his words. Earlier this year, he gave the cardinal’s red hat to Alfonso Lopez Trujillo, a Colombian sympathizer with Opus Dei and a staunch opponent of liberation theology. Inside the Vatican, Lopez Trujillo is considered the protege of Sebastiano Cardinal Baggio, another Opus Dei ally, who heads the Pontifical Commission for Latin America (the pope’s main source of information on events in that region). One of Lopez Trujillo’s closest aides is Roger Vekemans, a Belgian priest who received as much as $5 million from the CIA during the 1960s, which he in turn gave to anti-Communist organizations in Chile. Vekemans has also written articles and books condemning church activists and liberation theology. In October 1982, President Reagan sent his roving ambassador, General Vernon Walters, a devout Catholic, to confer with John Paul II. The pope may have wondered why Reagan would select a former deputy director of the CIA, one who had been involved, both before and after he joined the agency, in some of its most notorious coups: Iran, 1953; Brazil, 1964; Chile, 1973. More recently, Walters has played a key role in organizing CIA-backed Nicaraguan exile groups based in Honduras who are seeking to overthrow the Sandinista government by force. Not surprisingly, the situation in Latin America was one of the main issues that Walters discussed with the pope. He also attempted to convince the Holy Father that the American bishops had erred in drafting their pastoral letter opposing nuclear weapons. Although John Paul II stood fast on the nuclear question, soon after Walters left the pope did demand that five priests with official positions in the Nicaraguan government resign from office. Such developments reaffirm the significance of the Catholic church as an intelligence priority, and the CIA undoubtedly will continue to utilize its contacts in the Vatican and in conservative lay orders to bring its influence to bear on the papal chambers. But the agency realizes that much has changed since the days when all good Catholics obediently toed the line of the Vatican hierarchy and Catholic churchmen at all levels cooperated willingly with American intelligence. The Catholic church, once a rock-solid monolith, is now in a state of flux. The new church poses an enormous challenge to the agency. The pontiff is no longer an absolute monarch. The papacy has become a point of convergence for a multiplicity of forces, an arena in which competing ideologies vie for influence. The CIA, accordingly, has gradually revised its strategy from one of using the church to one of splitting the church. By encouraging internecine conflict between progressive and reactionary church elements, it has made a direct assault on John Paul II’s cherished ideal of a unified church that can speak to and for all people. For his own part, the pope has attempted to walk a fine line, acknowledging the need for social reform while expressing disdain for the grassroots movements that also advocate it. He cannot embrace progressive Catholic organizations, because they threaten to undermine papal authority. The mixed signals John Paul II has been sending his bishops in Latin America (where more than half the world’s Catholics will reside by the year 2000) are evidence of the dilemma he faces. To the extent that he denounces injustice and oppression, he risks the wrath of the CIA. But if he fails to be a sufficient critic of fascist governments that kill priests and nuns, many of his followers will seek other roads to salvation.